I began to take the chicken out when I suddenly remembered to take a photo. Photo by Copyright 2014 Deborah Kaplan. One doesn’t necessarily have to like North African/Middle Eastern cuisine to use a tagine as it is a versatile cooking vessel used for slow cooking. 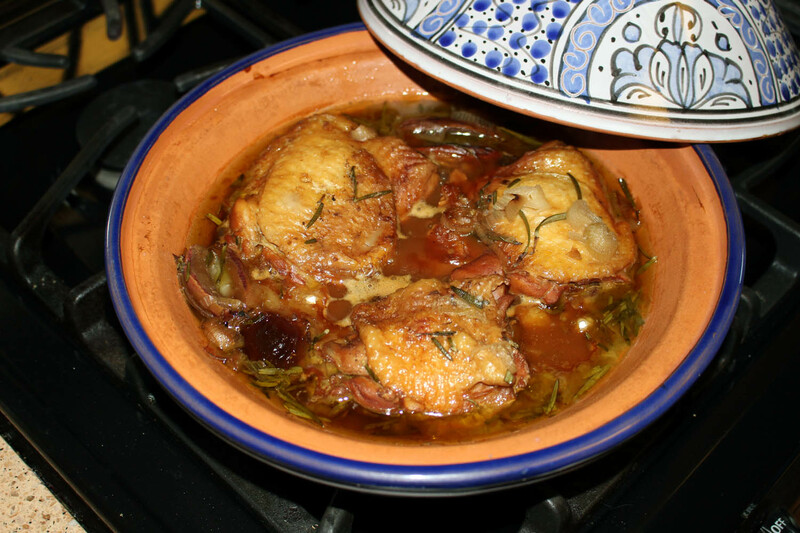 Although, when cooking with my tagine, the chicken cooked faster than I expected on the smallest flame at the low setting. So with that thought in mind the vessel appears by its design, meaning the conical shape, to be a fast slow cooker. I can’t believe that I actually received this tagine 2.5 years ago, as my one daughter pointed out to me after posting about it on this blog. The below recipe is not any particular cuisine as it is just ingredients that I like and go well together. I served it on a bed of buttered couscous. My experience with the tagine is on a gas stove top. For electric stoves, you will need a diffuser so the tagine isn’t sitting on direct heat. Cooking times will most likely be longer since the heat will be diffused. Add olive oil to a skillet and brown chicken thighs about 15 minutes, turning them over midway through. Place bottom of tagine on stove with no flame. After chicken thighs have been browned on both sides, add just the chicken to the broth mixture. Add dates, garlic cloves, Worcestershire sauce, shallots, thyme and rosemary leaves. Place lid on tagine and refrain from removing lid for 1.5 hours. Mix flour in cool water until lumps have dissolved. Add flour water to tagine fluid. Place lid back on and cook for additional 1.5 hours.